A remake of a previous Neo Nectar Unit appears, armed with a new ability. Bloom – AUTO (RC) 1/Turn GB1: When another Unit with the same name as this Unit is placed on (RC), during that turn, this Unit gains Power+10000, then when that turn ends, you can pay Soul Blast 1. If you do, this Unit returns to the hand. 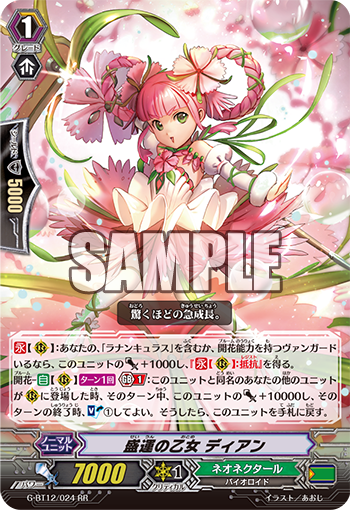 For Today’s Card, from the 12th Booster “Dragon King’s Awakening” (on sale August 25th, 2917), we’re introducing “Prosperity Maiden, Diane”, a card that bolsters 《Neo Nectar》’s “Ranunculus”. “Prosperity Maiden, Diane” is a remake Unit of “Budding Maiden, Diane”. If your Vanguard is a “Ranunculus” or has 【Bloom】, it gains Power+10000 and 【Resist】. This makes it difficult to Retire via the effect of your opponent’s cards, and it’ll be able to play a solid role in the early game with 8000 Power. Also, when a Unit with the same name as it appears in a Rear-guard Circle, you can activate its 【Bloom】 ability, granting it 10000 Power and allowing you to pay 1 Soul Blast when the turn ends, it can return itself to the hand. If you combine it with “Midsummer Flower Princess, Lieta” who we introduced in last week’s “Weekly Vanguard News Bits” and “Weekly Vanguard Column” You’ll be able to Call a swarm and increase the size of your hand enormously. Also, you can activate its 【Bloom】 ability every turn, allowing you to use it as a Guard to increase your defenses. There’ll be more cards from “Dragon King’s Awakening” in future “Today’s Cards”! Please enjoy!